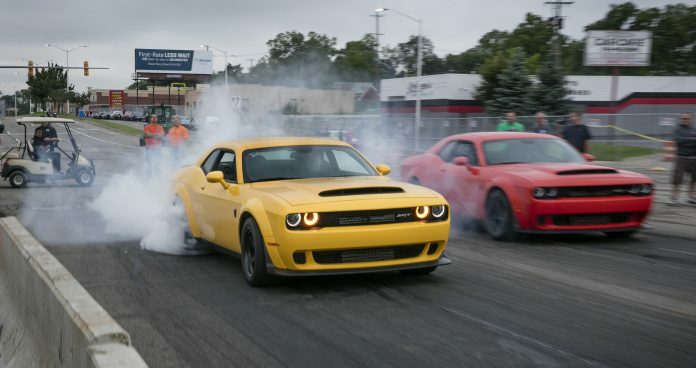 Auburn Hills’ FCA Wednesday announced its fourth annual Roadkill Nights Powered by Dodge, a day of legal drag racing and thrill rides scheduled for Saturday, Aug. 11 at the M1 Concourse in Pontiac. Roadkill, a Motor Trend Group brand, is producing the event. The day will feature the 707-horsepower Dodge Challenger and Charger SRT Hellcat models thrill ride experiences, additional celebrity showdown races, and an overall $40,000 purse, the largest so far. “Last year, more than 40,000 enthusiasts celebrated performance car culture at Roadkill Nights Powered by Dodge in an epic kickoff to a week of cruising events (leading up to the Dream Cruise on Saturday, Aug. 18),” says Steve Beahm, head of passenger car brands – Dodge/SRT, Chrysler, and FIAT, FCA – North America. This is the fourth year for the event and the third year on Woodward Avenue. There will be two classes for drag racing – the Big Tire and Small Tire – with a $15,000 purse per class. An additional $10,000 will be awarded to the celebrity showdown race winner’s charity of choice. Winners of the classes will earn $5,000 each, while runner ups will get $1,500 each. There will be two payouts for semifinalists, who will earn $750, and four payouts for quarterfinalists, who will win $500. The fastest Dodge-powered vehicle will get $5,000. The 707-horsepower Dodge Charger and Dodge Challenger SRT Hellcat models will be in two locations within the concourse, one for drifting on a skid pad and the other on the north loop of the M1 track. Industry celebrities will also participate in showdown races and freestyle motocross exhibitions at the event. Leah Pritchett in her Dodge/Mopar Top Fuel Dragster and Matt Hagan in his Dodge Charger Funny Car will again attend. Other returning fan favorites include the high-octane virtual head-to-head racing in Dodge Challenger SRT Demon simulators, show ‘n’ shine, dyno testing, “Roadkill” stunts, flamethrower and wheelstander exhibitions, activities for children, and food trucks. Gates will be open from 10 a.m.-11 p.m. with Dodge Thrill Rides taking place form 10 a.m.-10 p.m. and drag racing from 11 a.m.-10 p.m. General admission is $10 per person and $5 per person for Pontiac residents. The $5 price is available on-site only. Children 12 and under are free. Tickets, show ‘n’ shine registration, package information, and drag racing applications are available here.